I have been accused of eating healthy. Seriously? Don't those friends read this blog? Oddly enough, I have also been called a chocoholic. Now that we know that chocolate is a tasty source of antioxidants, it turns out that eating chocolate might just be a healthy thing! So today, I'm offering a Valentine treat that's easy to make, and has some health benefits, while being indulgent, too. The best of all worlds. 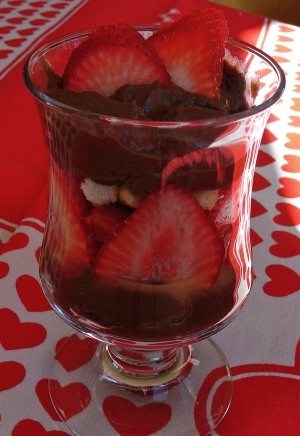 Since chocolate is traditional for Valentine's Day, I'm treating my Valentine to chocolate trifle. The hardest part of this entire recipe is making the pudding, and that's not difficult at all. 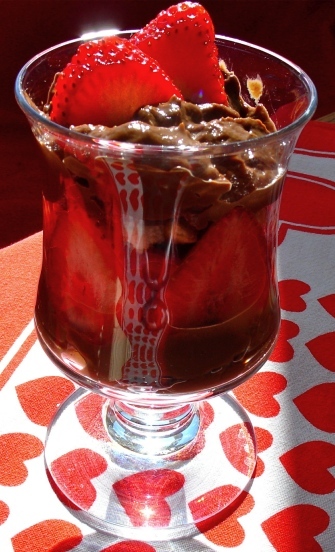 I made my favorite chocolate pudding with Pensey's powdered cocoa. The flavor is so intense that no one will notice that you made it with fat-free milk. Okay, so the recipe calls for a smidge of butter, but really very little and you can skip that if you want. Just as an aside, it has been bitterly cold all over, and there's nothing more comforting than warm pudding. 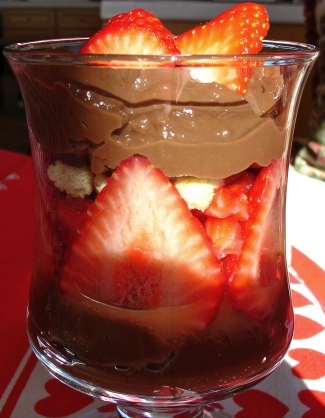 If you and your sweetie eat the pudding warm and never make the trifle, well, I'll never tell. Shh! Half of you are looking at this and saying, sure, like I have fresh strawberries just hanging around the house. No strawberries? Use bananas instead, they go great with chocolate. No lady fingers? No problem -- crumble in some gingersnaps or graham crackers or macaroons, even! Another thing I like about these individual servings is that they can be tailored to suit you. If you're making them for your children, you can substitute orange juice for liqueur. I used Chambord, a raspberry liqueur, but if you prefer Amaretto or banana or orange liqueur, then go for it! Hmm, there's not much that doesn't go well with chocolate, is there? If you have a favorite pudding recipe, then by all means use it instead. 1. Pour the milk into the Pyrex measuring cup. 2. Combine the sugar, cocoa, cornstarch, and salt in the pot. Whisk together and get rid of any lumps. Use the whisk like a spoon, it’s just more efficient in breaking up the lumps. 4. Measure the corn syrup in the same Pyrex cup. Add to the pot and whisk in. 5. 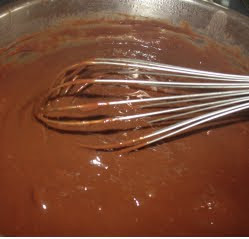 Turn the burner to medium high and bring to a gentle boil, using the whisk as a spoon and stirring. You may need to turn down the heat when it begins to bubble. Cook so it gently bubbles, stirring with the whisk for one minute. It will thicken. 6. Remove from heat temporarily. 7. Break the egg into the same Pyrex cup and whisk with the small whisk (or a fork). 8. Add the egg to the milk mixture and whisk in. 9. Bring to a gentle boil again and let cook for one minute, stirring the whole time. 10.Remove from heat and stir in the vanilla and the butter. If you're making the trifle, let it cool before you assemble the trifle. You can make the pudding a day or two ahead of time if you like. Spoon pudding into bottom of glasses. Slice fruit and toss with lemon juice. Arrange slices around sides of glasses. Reserve 8 slices of fruit for garnish. Chop excess fruit. Add a layer of crumbled cookies inside the fruit slices. Sprinkle with 1 1/2 teaspoons liqueur. Add a layer of the chopped fruit. Add another layer of the crumbled cookies. Oh Boy... Adult Pudding! I have a banana rum that would go great in this! Happy Valentine's Day ladies, hope you are all treated well tomorrow! Ooohhh,that looks gorgeous Krista. Got to put in on my "to be made" pile. I'm never too fond of liqueur in dessert, so I'd probably try with the OJ. It's very versatile that way, Lucy. Plus, the visual impact and taste make it more impressive than just plain pudding. 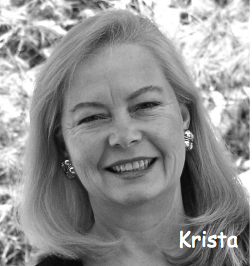 Krista, how pretty is this! My honey is out of town, but I'll be making it our special treat when he gets home on Thursday. Perfect!!! Dave, you're so right -- it is adult pudding. It's just dressed up a little bit. Happy Valentine's Day to you, too. I know *your* wife will be getting a special dinner! Do you think crumbled angel food cake would work well with this? I have one here that I can use.. I also have some cookies. Which would work better? Oh, Shawn! I'm swooning at the thought of angel food cake in it. I would be very tempted to try it. Let me know how it is, it sounds just wonderful! Cleo, I'm all for using angel food cake in it. Yum! I love Frangelico, and crushed hazelnuts sound terrific. Does anything not go with chocolate? LOL! Ok, I am going to make it with angel food cake. Will let you know how it turns out. I am sure it will be fabulous! I wish I were there to try it! Ok I made the trifle. I had to make a few alterations as I was in the ER last night and my finger is all bandaged up... (my furry niece, brothers dog was over and bit my finger/knuckle pretty bad.. friendly bite taking a treat)... anyway got off topic... I did not make the chocolate pudding from scratch I used the instant no cook one... I also used angel food cake and Amaretto. It taste GREAT!!! I KNOW my husband will LOVE it.